You've carved up your pumpkin, leaving a nice pile of sticky, slimy "guts" on the countertop. What do you do? In minutes, you can have a super healthy and allergy friendly snack that everyone will love! 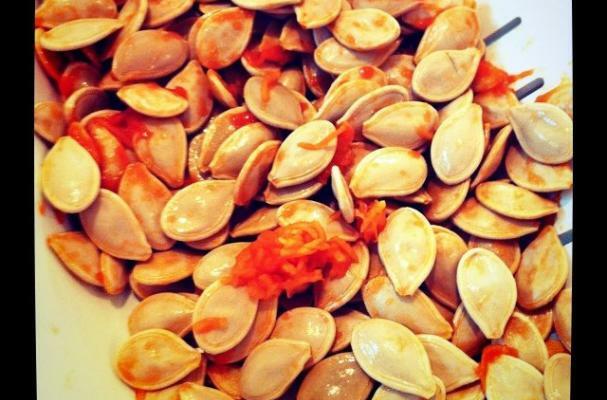 Here are my 3 of my favorite allergy friendly recipes to prepare and enjoy pumpkin seeds - a perfect way to reduce waste and a super kid friendly snack! These recipes are gluten free & wheat free, GFCF, dairy free, vegan, vegetarian, eggless, soy free, corn free, grain free. Paprika, garlic and a dash of cayenne pepper make these an addictive snack! As easy as 1-2-3, nothing could be simpler! Cinnamon sugar meets chili powder in this must-try recipe!